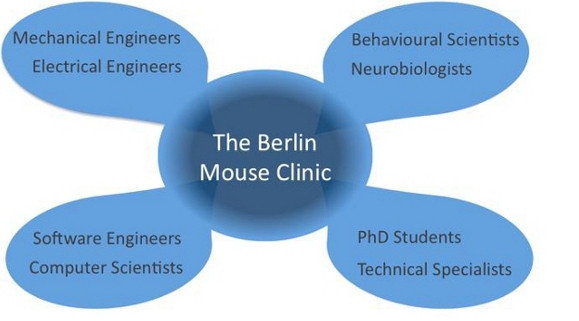 The Berlin Mouse Clinic for Neurology and Psychiatry (BMC) is a research institution at Humboldt University, affiliated with the NeuroCure Center of Excellence and Charité medical school. It is funded by the German federal and state government, and through our collaborating partners. The BMC takes a core position in the process of translating preclinical discovery to clinical practice. BMC project funding depends on collaborators contributing to covering direct and indirect costs. Direct costs include BMC personnel, animal maintenance, specific test equipment. Indirect costs arise from administration, technical maintenance, statistics, computer science expertise, and university overhead. Project cost is reduced when collaborators actively share experimental work. Research follows a collaborative approach. Scientists of the BMC provide expertise for the behavioural diagnostics of animal models through consultation, experimental planning, experimentation and data analysis. Collaborations usually result in joint scientific publications. We can also provide CRO research services. A knowledge database of diagnostic procedures for animal models of neurological and psychiatric functions is under preparation as an online database.